Built by Ming (1368-1644) rulers, the Hall of Imperial Peace (Qin'an dian) is located in the center of the Imperial Garden in the north of the Forbidden City. In 1535, the Jiajing Emperor constructed a wall around the Hall, making it an independent compound. Later in the Qianlong reign (1736-1795), the hall was given porticoes along the front facade. The porticoes no longer survive. The hall housed the spirit of the True Martial Ruler (Zhenwu dadi), the northern god of Daoist teaching. It has a double-eaved seal-case shaped roof, and was surrounded by exquisitely carved white marble balustrades. In front of the hall flanking the central way, two cypresses with their branches reaching out form an arch that is a spot of interest in of the Forbidden City. 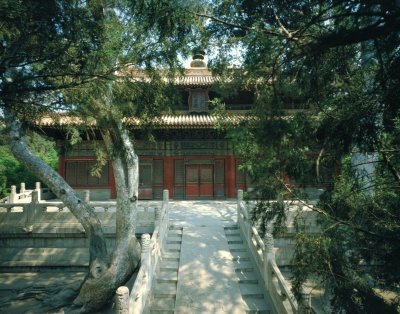 The Hall of Imperial Peace is the only Daoist temple located on the central axis of Beijing. 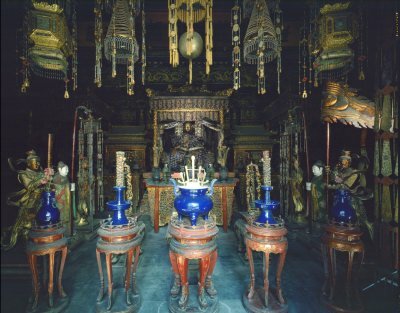 In Qing times, emperors worshiped here and presented burning incense sticks to Daoist deities on the lunar New Year and other festivals.